Alun Armstrong singled out the “outstanding” performance of man of the match goalkeeper Adam McHugh after Blyth Spartans’ 0-0 draw at Matlock Town on Tuesday night. But he also felt the performances from all of his players meant Spartans fully deserved a share of the spoils. 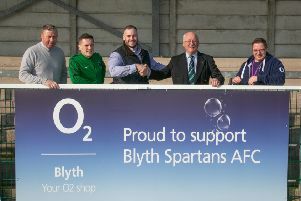 McHugh thwarted Michael Williams by saving his spot-kick in the 39th minute, before he produced a highlight reel of fantastic saves throughout the rest of the game – in order to ensure that Blyth claimed a point in their Evo-Stik Premier League clash with the Gladiators. And Armstrong was quick to praise his keeper’s fantastic showing, but he also revealed that he was happy with the performance of all his players on Tuesday night – after a four-hour trip down to Derbyshire. Armstrong said: “I thought Adam McHugh was outstanding. Whatever he needed to do, he did. He’s made a number of good saves, he saved a penalty – which I didn’t think was a penalty, mind – he stood up throughout the game and did really well. “I’m chuffed to bits for the lads – as I thought the work ethic they put in and they got the result they deserved. “It was definitely a point gained, without a shadow of a doubt. I said to the lads that they did extremely well – considering some of them didn’t finish work until 4pm and then had to drive straight down, before going straight out onto the pitch and having to perform like they did. McHugh produced a fantastic instinctive save not long after his penalty heroics to help Blyth come off level at the break. He was called upon much more frequently in the second half, but ensured that his clean sheet would be preserved with a number of impressive stops between the sticks. The Blyth boss was under no illusion that McHugh’s performance was the main factor of his side claiming a point, but he hopes that Spartans’ number one can inspire confidence in his defenders going forward – after what he knew would be a tricky test on Tuesday night. The 41-year-old said: “Sometimes, that’s what you need; you need a confidence boost from your goalkeeper. Adam could go away from the game and think ‘I’ve earned my side a point tonight’. “Now, the lads will look behind and know they have someone they can rely on. I’m really pleased with the result – following a long midweek trip to get down to Matlock. “We dominated against Mickleover on Saturday, we had so much of the ball and used a lot of energy. Then, to make that sort of trip on a Tuesday night – after the lads have all been at work – and travel four hours before having to go out and play against a side doing well, it was always going to be a hard one. Due to the club’s scheduled trip to Nantwich Town being postponed on October 1 – thanks to the Dabbers’ FA Cup commitments – the game against Matlock saw the former Ipswich Town and Middlesbrough striker take to the away dugout as manager for the first time. Despite being used to arriving to any amount of away grounds throughout his playing career, Armstrong admitted that he is still getting used to the non-league scene but revealed he is enjoying the experience so far. He added: “It’s really tough, but I’m going to have to get used to it – as I’m still trying to remember the change from professional to nonprofessional. It’s strange for me, but I’m really enjoying it. “I enjoyed the whole experience against Matlock, even though we didn’t play as well as I know we can. I could see the lads were there for each other though and working hard for one another, which is what I’ve been telling them I want to see. That clean sheet was Blyth’s third in four games since Armstrong’s appointment and – despite a blip against Warrington in a 3-0 drubbing – the new manager has learnt from his mistakes already and is looking for his side to present problems to the opposition by performing to their best. “My first thing when I came in was that we had to stop conceding goals and I’ve set us up to play 4-4-2 three times and we haven’t conceded a goal. We’ve played 4-3-3 once and conceded three goals, so that tells me something straight away; don’t expect us to be playing 4-3-3 any time soon,” Armstrong joked. “I think the lads have had so much success with 4-3-3 over the last four years, that they thought we could carry on and play our football with this formation. However, they forget that people can suss you out quite quickly and – for the teams we play against – it’s normally 4-4-2 that you’re up against, be it a diamond in midfield or with the two wide lads. This new-look Spartans side has managed to somewhat stop the rot that saw them ship nine goals in just three games last month, but now have problems at the other end instead – as they have only managed three goals in their last four games, with all of them coming in the win over Mickleover Sports last Saturday. However, that hasn’t stopped Armstrong from stating that Blyth can return from Hednesford with all three points in Blyth’s next game. Armstrong said: “We want to be hard to beat, but we need to start creating chances as well. Matlock was purely about coming away with something, but we’ll be looking to build on that at the weekend and try and go for the win at Hednesford. “It will be a really tough game and another long trip for us, but we’ll have a look at what we’ve got and work on some things at training on Thursday – as we want to be ready to go again on Saturday. Blyth’s struggle for goals has coincided with the calf injury suffered by top scorer Daniel Maguire during the 0-0 draw with Spennymoor Town, which was Armstrong’s first game in charge. Therefore, the news that the striker could be close to a return will be a relief to the Spartans’ gaffer, who hopes that the 23-year-old might be available for Saturday’s trip to the Midlands. Armstrong said: “Again, we’ll see how Nipa is on Thursday. He hasn’t trained with the team since it happened, but we’ll see what he’s like and we might get a little bit out of him at training this week – as long as he’s had no reactions during the week. “Fingers crossed we have him available but, if not Saturday, then we’ll look to the next game for him. He is a big miss – as, like I’ve said before, he’s completely different to everyone one else that we’ve got.